The other day as I was on my way upstairs, I came upon Gus as he was on his way downstairs. He looked at me, and then he stopped in his tracks. He paused for a bit, as if to consider his options. Then he watched me go past him. After an awkward minute or so, half-sitting on the stairs, he maneuvered himself somehow, turned around, and then proceeded to follow me where I was going. I captured this shot of him in that moment where he frozen halfway; neither up nor down. I think you can see the awkward look on his face, as if he isn’t quite sure which way he should be going. In a funny coincidence, I happened to be speaking to my Mom later that afternoon. When I asked her how her day was going she said, “to be honest, I feel like I’m going up the down staircase.” I laughed and told her of my experience with Gus. I said that she wasn’t alone; and that he was having the same kind of day. They happen to all of us. Those days where we just can’t seem to get it all together. I’m sure you can relate, and can think of a day, perhaps even recently, when nothing seemed to go according to plan. 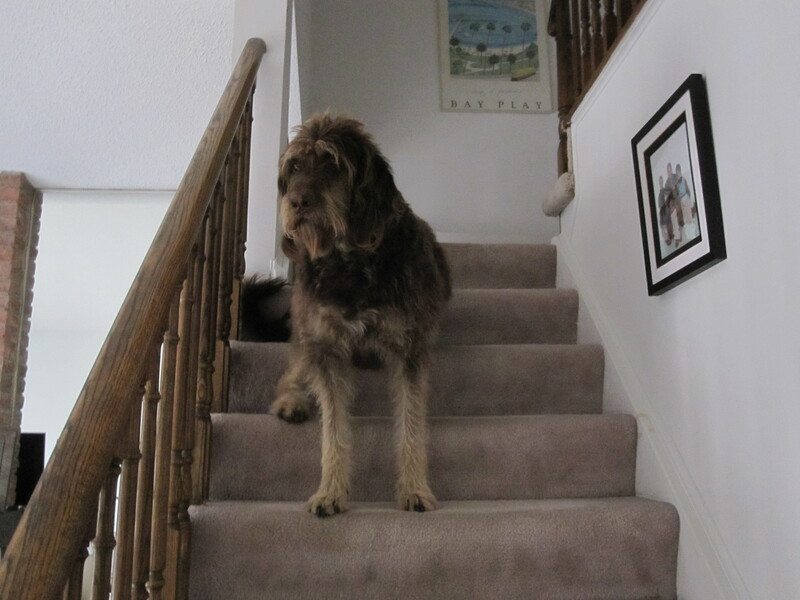 On those kind of days you often feel as though you’re spinning your wheels, or, like Gus, sitting halfway up the middle of the stairs trying to figure out if you should be going up or down. They are often days that leave me feeling as though I haven’t accomplished much of anything, even if I’ve seemed to be busy all day. The good news is that these days usually pass quite innocently. If we don’t get too stressed about them, we can usually get back into our regular mode pretty quickly. I’ve learned to accept that sometimes there will just be days like these, for whatever reason. Maybe we have too much on our minds, or maybe we’re just plain tired out. Whatever the cause, the best thing to do is to just give in and cut yourself a little slack. When I find myself feeling this way, I usually try to keep a low profile, and I try not to take on anything too demanding. These are often great days to just treat yourself to a little indulgence – even if it’s only a cup of tea and a half hour with a really good book. With a little TLC, everything ends up going in the right direction!